The amount of items that home cooks need to store in their kitchen cabinets is mind boggling. The sheer number of different types of items makes cabinets harder to organize than any other space in your kitchen and that is why sticking to a simple organization strategy is key. Namely, group like items with like items. See the basic process of organizing your kitchen cabinets, with in-depth resources to help you. Don't try to tackle this project until you're motivated to see it through. This is a fairly big undertaking (on the level of organizing the garage and your clothes closets), so it's important to be motivated to keep going, no matter how much of a mess you may create halfway through. If you're lacking motivation, here's why it's important to get this space organized. It will save you money because you will no longer buy duplicates. You'll know what you have on hand and you'll have a vague idea of how many items you have in storage. It will save time because you'll know where everything is. You will no longer need to hunt through cabinets to find the rice cooker. You will be able to easily reach for the cutting board because you've taken the time to store it appropriately in the space you most often need it. Organized kitchen cabinets will make meal planning and grocery shopping easier. When you know what you have, on hand, it's a lot easier to plan meals and shop for ingredients. You'll have a good idea what you use most often and what items you can move out of your prime real estate. It will make cooking much easier. Moving the right tools, measuring cups and mixing bowls into the most efficient spaces means less time wasted running around the kitchen trying to locate the right sized pot lid. Organized kitchen cabinets are easier for family members and guests. They can find what they need in the kitchen without a hunting expedition. It will make cleaning easier. When everyone in the household is used to items being in the same spot all the time, they will be more likely to put it back into its proper storage space. Decluttering your kitchen cabinets is the absolute must-do first step to organizing your cabinets. You must do this before you buy storage solutions or being to rearrange items. Set up a large trash container and a box for items to donate or sell. Go through each cabinet and sort items into the trash or the donate/sell box as appropriate. Remove those from the kitchen. Once you've gone through the kitchen cabinet decluttering process, it is time to organize the contents of your kitchen cabinets. At its basic level, organizing kitchen cabinets means arranging your foodstuffs, appliances, pots and pans and kitchen tools in ways that make a lot of sense to you and your family. Do not get caught up in appearances; no one is Martha except Martha. The watchword to organizing kitchen cabinets is: make everything you use regularly as accessible as possible. If you always stand in front of the stove while cooking, you want everything you use when preparing meals to be as close as possible to the stove. Don’t put your spices in a cabinet all the way on the other side of the kitchen and out of your reach, place them as close to the stove as you can. If you want your small kids to get their own snacks or dishes, place the items they’ll need in the cabinets they can reach. In any kitchen, remembering where you put something away starts with reserving some cabinets for anything that’s edible and others for anything that’s not. Preferably, the separation will have some logic to it—food to the left and tableware to the right, or food in the upper cabinets and everything else in the lower ones. If you have a tiny little kitchen with only one cabinet, just create separate sections in that one cabinet. Maximize storage by sorting items into categories. Even within the separation above, you can break items down into categories that will make it easier to use your kitchen. For example, say you move all of your edible items to your two left-hand cabinets. You can then decide that one of these is for cans, and one for other types of packaging. One could be for frequently used foods and one for the stuff you reach for less often. One could be for healthy meal staples and the other for fun snacks. If you drink coffee from a mug every day and drink wine from a wine glass once a month, your coffee mugs should go in the part of your cabinet that’s most easy to get at, and your wine glasses can go have a less desirable bit of cabinet real estate. If you keep certain foods or serving platters around because you use them on rare occasions, put them in the cabinets that are least convenient. Turning a jumble into an organized set-up makes everything in your cabinets easy to see and to access. Try to keep labels facing out, boxes lined up, and bowls stacked in order of size. If your cabinets are small, few in number, or hard to reach, there’s no reason everything you own has to go in them. Some of what you’ve been trying to fit into your cabinets would be better placed on your kitchen counter, on top of your fridge, in a rack on the wall, or somewhere else. Taking the items that don’t work in your cabinets out will free up cabinet space for other things and let you (not whoever designed your house or apartment) dictate how you use your space. The trick is to install only as many kitchen cabinet organizers as you need and no more. Group similar items together and then organize the groups into zones. When you are putting things away into their zones, keep function in mind over form. For example, if you use a certain cutting board more than another one, even if it is not as pretty, move it to the front. 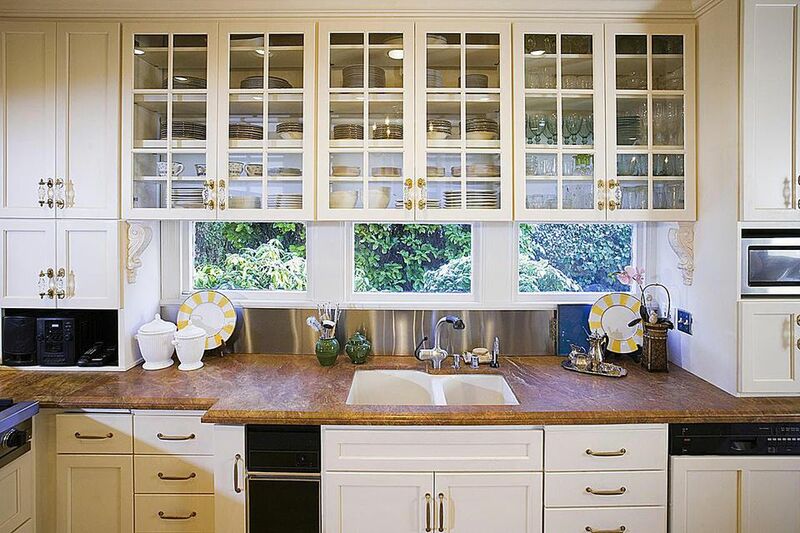 Your kitchen cabinets should be usable, not photogenic. Food: Storing food in the kitchen cabinets is recommended only for those kitchens that do not have a pantry. If you do have a pantry, first, try to store as much food as possible in the pantry leaving the cabinets for tools, pots and pans, and appliances. Group food including spices, bottles, and filled food storage containers in the cabinets just above your kitchen workstation (the counter space you use to chop, knead, and mix). This way they can be easily accessed while prepping. Glasses and dishes: Group and store glasses and dishes directly over either your dishwasher or the drying rack for quicker cleanup and storage. Cookbooks: Store cookbooks in your non-prime real estate areas because you will not be reaching for them as often as food and dishes. If you have the extra wall space, consider installing a small shelf for cookbooks. Food storage containers: Store your plastic and glass storage containers right above the counter space you use when you will be filling them with leftovers or bulk purchases. Appliances: Store kitchen appliances in the bottom cabinets just below your main work area for easy access during food prep. If you use an appliance daily, consider moving it to your countertop. Pots, pans, and baking sheets: Store your kitchen pots and pans in the bottom cabinet, with pans on their side to maximize space and pots nesting together. Lids should also be stored vertically (you can rest them vertically in a large square Tupperware container). Mixing bowls, cutting boards, and salad spinners: Store these as close to the drying rack or dishwasher as possible for easy cleanup and storage. Cleaning Supplies: Store your kitchen cleaning supplies in the bottom cabinet, preferably under the sink. The space under the sink tends to be such an awkward space, it makes the most sense to store bottles and sprays, which take up little room, in this tight spot. If you have small children or pets, consider a child-proof lock on the cabinet that has the cleaning supplies. If the bottom cabinet has more than one shelf, store the cleaning supplies on the bottom shelf in case of leaks or spills. Never store cleaning supplies above or on the same shelf as food items. Someone could not notice a spill and eat or cook food contaminated with the product. Plan to go through your cabinets and do a complete overhaul once or twice a year, depending on what type of cook you are. For helpful reminders, follow a month-by-month organization plan, which will prompt you to reorganize your cabinets two to three times a year. Begin doing quick ​30-minute decluttering sweeps weekly.